Chopard makes the perfcet partner for Porsche and endurance races. Georgina Wilson-Powell explores why. Luxury Swiss watch brand Chopard might be more well known for its female watches but the brand has slowly shifted over the last 30 years to create a range of lines, with its L.U.C watches designed in Fleurier at a rate of around 4,000 a year while its more prestigious timepieces are created in Geneva and bear the stamp of Poinçon de Genève with annual runs of under 1,000. All in all there are 80,000 different watches available. Despite its more feminine start, the brand has over the last 30 years developed a deep love and become known for its support for motorsports. Chopard has always seen a synergy between the worlds of watchmaking and that of motorsports. Dedication, perfection, a constant quest to be the best and to push what is possible, all of these attributes apply just as much to watch making as they do to motorsports – and engineering is also at the heart of both these pursuits. 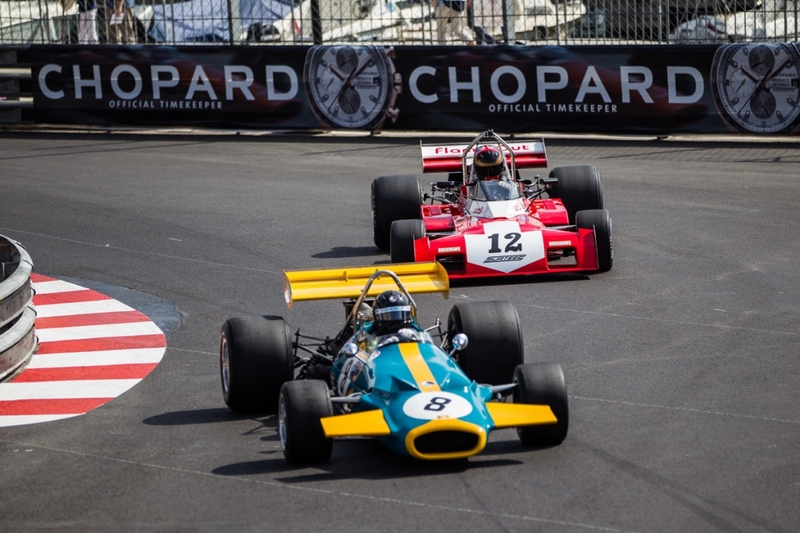 It’s no surprise that Chopard’s directors are keen motorsports lovers, while the co-president Karl-Friedrich Scheufele collects vintage cars as well. It is really Karl Friedrich, who became one of two Vice Presidents in the 1980s who has really driven Chopard into pole position for supporting a variety of endurance related motor sports. While his father bought Chopard in 1963 from the grandson of the original founder (Chopard began way back in 1860), Karl-Friedrich’s own love of cars and racing has seen the brand move forward with purpose and passion into being one of the premium partners when it comes to races like Le Mans and Mille Miglia. The house has such a strong connection to the world of motorsports and Porsche particularly that when Porsche decided to stage a grand comeback to the FIA World Endurance Championship in 2014 with its 919 Hybrid, there was only one brand they turned to – Chopard. And of course it was supported with a limited edition watch – the Chopard Superfast Chrono Porsche 919 Edition. Porsche obviously are one of the most well known names in motorsports and will always been a moderately safe bet for a brand to partner with. They have huge brand awareness and a global and loyal fanbase. But of course Chopard’s connection to motorsports goes back much further than 2014. It became the official timekeeper for the infamous Mille Miglia race in 1988, issuing a limited edition watch that echoes the vintage car race to accompany it, and it has done every year since. Mille Miglia is of course, the 1000 mile race between Bresnia and Rome in Italy made every summer, with over 400 vintage cars trying their luck. The Chopard’s Scheufele family often take part themselves, tying together their love of vintage cars and sportsmanship. The Mille Miglia collection expanded to include a GTS (Grand Turismo Sport) last year and at Baselworld, the house found popularity with the Chopard Mille Miglia GTS Power Control which featured a new calibre 01.08-C automatic movement. 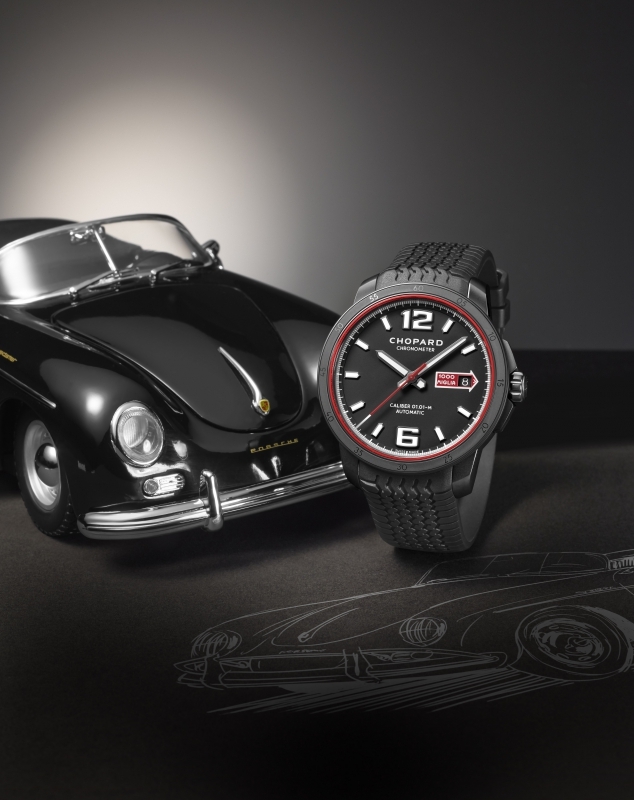 But it’s not enough to celebrate the vintage car race, the brand also has celebrated individual racing drivers, for example there are Jacky Ickx watches under the Mille Miglia collection, which commemorate the famous Le Mans driver, who won the endurance race six times. This year it was Le Mans that inspired the Superfast Chronograph Porsche 919, dubbed the ‘black edition’, it was launched at the French race, in support of Porsche who were fighting to defend their title (first and second place) from last year. A hundred piece run, this superb, sporty Chopard number runs on a COSC-certified 03.05-M automatic chronograph movement, has a 60 hour power reserve and the 919 logo in the 9 o’clock dial. The back confirms that the watch is the official timekeeping partner for Porsche. The company has also brought on board Mark Webber as a brand ambassador. The racing driver won the World Endurance Champtionship for Porsche in 2015, so his appointment only strengthens the synergy and commitment between these two brands. While Webber was moderately successful as an F1 driver, hs shift into WEC has seen him go from strength to strength, using his endurance skills and teamwork with his two supporting drivers to be first across the finish line – these are all skills that again align with timepiece makers Chopard. While it might be looking back to distill the days of vintage cars with some of its races, Chopard has proven time and time again that it knows how to make the best relationships work for it to secure its future, both as a timepiece manufacturer and a global brand with luxury appeal. Not satisfied with just the world of motorsports, Chopard has also moved into the world of hospitality, purchasing 1 Place Vendome in Paris last year, the hotel which housed its French flagship store. A couple of years ago Karl-Friedrich Scheufele also bought a chateau in Bergerac to make the most of its famous vineyard. Monestier La Tour produces around 12,500 cases of wine a year. Add to this his series of wine shops in Switzerland and perhaps we’ll start to see Chopard expand much more into the luxury lifestyle space in years to come.